In 2018 I checked off one item on my bucket list: I went to the largest and most famous YA Book Fair in France, the “Salon du Livre de la Jeunesse de Montreuil”, that takes place each year in early December in a town immediately north of Paris (it is on the metro network, so practically not even in the suburbs). It had been a long-time interest of me, but early December is usually a busy time at work. For a book-lover and an aspiring published writer, you would think that it is a feast to browse through countless books offered by the 450 publishers attending the event. Well, yes and no. I’m not doing well with crowds and the book fair has received no less than 179 000 visitors within 6 days. That’s a lot, by my standards or by anyone else’s. My strategy was to go on a Monday morning and it was objectively not crowded. I had ample time to check out books for all age groups, I didn’t fight or wait to reach the tables, although I did not attend book signings or readings by authors. Yet I had not taken into account how overwhelmed I would be. I literally could not decide what book I would buy. To the credit of the publishers, they all seemed equally good! I ended up buying nothing at all and coming back with lots of catalogues. The other downside is that I felt as if every story had already been told and I couldn’t see how my own stories would ever be published. 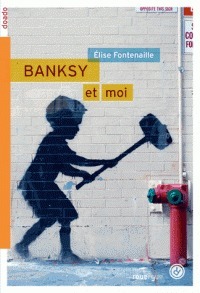 Banksy et moi, by Elise Fontenaille (2014), a short novel about a young French black growing up in the projects. The last book I’d read by Elise Fontenaille was terribly dark, and this one is all too sunny and glowy in comparison. Darwin, the narrator, is raised by a single mother who works as a night taxi driver and emigrated to France from Sudan on a rickety boat. He takes an interest in artful street art that makes the concrete derelict buildings around him less ugly. His pet is a rat named Banksy and his best friend is a mysterious girl, Eva. The book is full of quirky characters and feel-good moments, but I felt it was a bit naïve and too Polyannaish, especially in the end that feels a bit rushed. 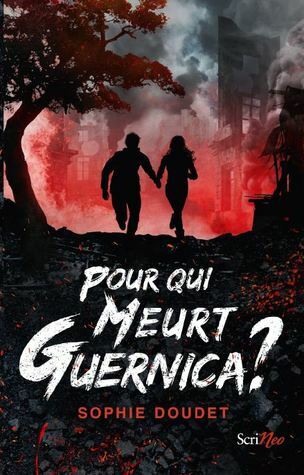 Pour qui meurt Guernica? (For whom Dies Guernica) by Sophie Doudet (2018) is a historical novel about two teenagers in the midst of the worst of the Spanish civil war in 1937. I just knew the basics of this historical era just before the onset of WWII : Nazis heavily supported the Spanish nationalist side that fought against Communists and liberals in general, and decided to experiment terror tactics on civilians that they would later use during their wide attack across Europe and Russia. It helped to have people embody the terrible fate of Spanish civilians, but it felt a bit too heavy-handed in the didactic part, and the characters lacked depth. Personne ne bouge (Nobody Moves), by Olivier Adam (2011) is my first reading of this bestselling French author. I enjoyed this novella about a young boy who sometimes experiences an interruption of time: he’s the only one who goes on with his life while the rest of the world is “on pause”, at unexpected moments. How will he use this strange gift? Should he try to change the natural course of events or do forbidden things? It definitely gave me a taste to try more of this new-to-me author.